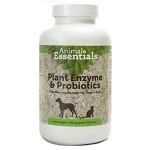 Probiotic Miracle for Pets helps resolve diarrhea, loose stools, gas and other digestive problems. Nusentia probiotics for dogs and cats provides 6 strains of probiotics chosen specifically for pets. If your pet suffers from diarrhea, yeast, loose stools, yeast overgrowth, or skin issues, Probiotic Miracle® can help restore balance in their digestive tract to resolve these issues. 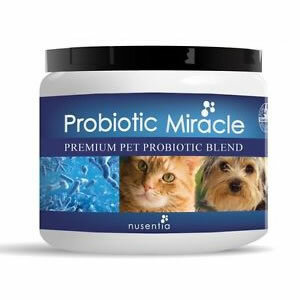 Probiotic Miracle is a concentrated probiotic powder formulated specifically for dogs and cats. Nusentia has selected six thoroughly researched species of beneficial bacteria to help sustain a healthy balance of flora in your pet’s digestive tract. Available size: 44 grams (appr. 120 servings). .
Probiotic Miracle has been an excellent product for my little dog Joey, who had been suffering from hot patches, very bad scent in his coat and scratching. I also use pure Salmon Oil from another vendor twice a day. Joey's coat has come back to life. I previously had searched everywhere to help Joey, spent a fortune at my vet for tests on him to try and determine what was going on with him. Now he is feeling much better and his coat is thick. My puppy Calli was constantly getting loose stools. I found this product on the internet and saw it had good reviews. For good reason. IT WORKS! I am a customer for life. 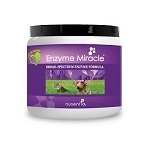 Nusentia Probiotic Miracle for Pets is formulated specifically for dogs and cats with bacterial strains not often found in formulas for human use. A variety of strains offers a wider protection against the bad bacteria that can trigger imbalance in the digestive tract. *2 Billion CFUs per 2 scoop serving is guaranteed at expiration of product. This product contains stable strains of live bacteria and may be stored at room temperature without loss of efficacy. For extended life, store in the refrigerator or freezer. Keep lid closed securely. Probiotic Miracle is filled according to weight, not volume, so the canister you receive will not be completely full. Manufacturing requires enough top space in the canister to avoid spilling and loss of powder during filling. Therapeutic dose - during illness, infection, allergies or GI-related issues. Give the dosage below for 3 weeks or until improvement in condition, then continue at the "wellness" dosage shown above. For pets with sensitive stomachs, start with half the suggested dose and gradually increase to the full amount after one week. Probiotic Miracle can be mixed with wet or dry food and has virtually no taste. There is a small scoop in the canister which sometimes settles to the bottom during transit.